Many residents of Big Sky, Montana, no matter what originally brought them here, never forget their first glimpse of Lone Peak, the iconic mountain that serves as backdrop to the community. Indeed, perhaps it was the clincher: Waking up to these views was what led them to put down roots in this particular place. Architect Reid Smith, who has designed his fair share of Big Sky homes, is no stranger to capturing these impressive views. 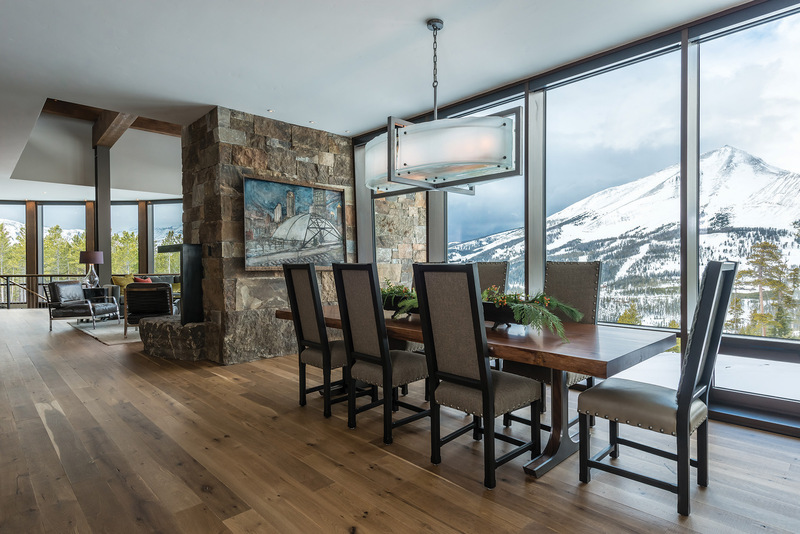 When it comes to framing Lone Peak in great-room windows, he’s pretty much a pro. Viewed from the peninsula-like lot, Lone Peak looms front and center — so close that if you squint, you feel like you might recognize that skier coming down the South Face — with Cedar Mountain directly to the west and Pioneer Mountain to the east. Although exposed, the home settles into the hillside with lodgepole forests on both sides, making the structure appear more unassuming than it actually is. 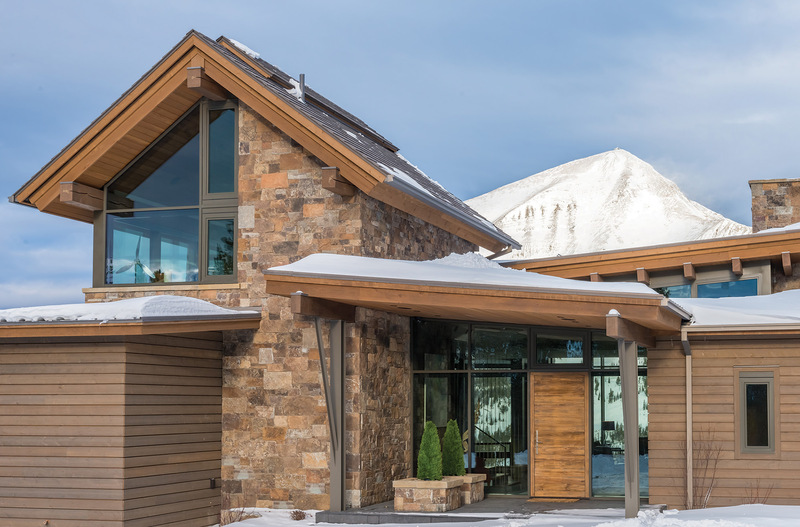 “The views unfold as you’re approaching the building site, so we created lower roof forms in the center and higher forms on either side to frame Lone Peak from the driveway,” Smith says. “Typically views are focused in one direction, but in this case you have views pulling you in multiple directions.” From inside, Lone Peak dominates the great room, and the mountains off to the sides give the views an endless feel. Smith was faced with the challenge of capturing these views in different parts of the home, a feat that he accomplished through a curved stairway, as well as staggered and offset building forms. From the office perched high to one side to the basement-level guest wing, the views remain intact. Focusing on grays as a base color, Coogan and Sanford bring in pops of orange and bright hues in the artwork and accents in the main living spaces. Guest quarters each have their own personalities, artwork, colors, and accents. The children’s rooms each are influenced by the occupant’s gender and personality. 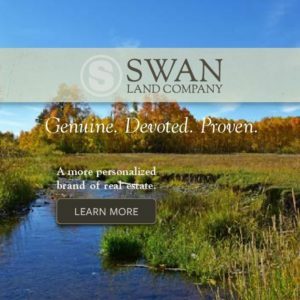 The home is as much a reflection of the homeowners as it is of the local talent used to put it together. 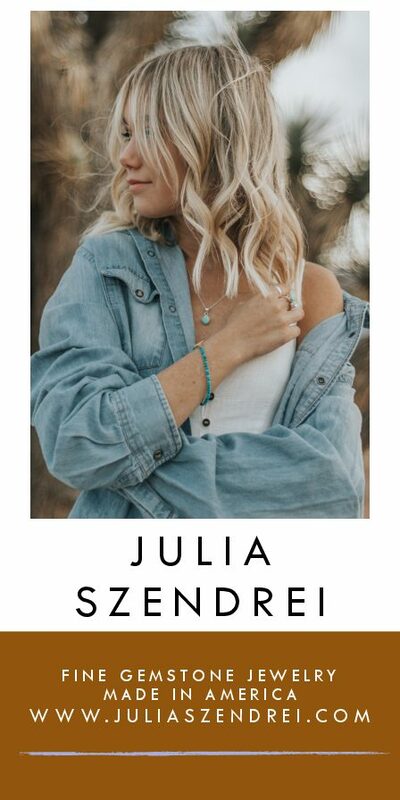 The collaboration between architect, builder, designers, and local artisans created a masterpiece that infuses innovation in design with comfortable living. The views are front and center, but family life comes first. 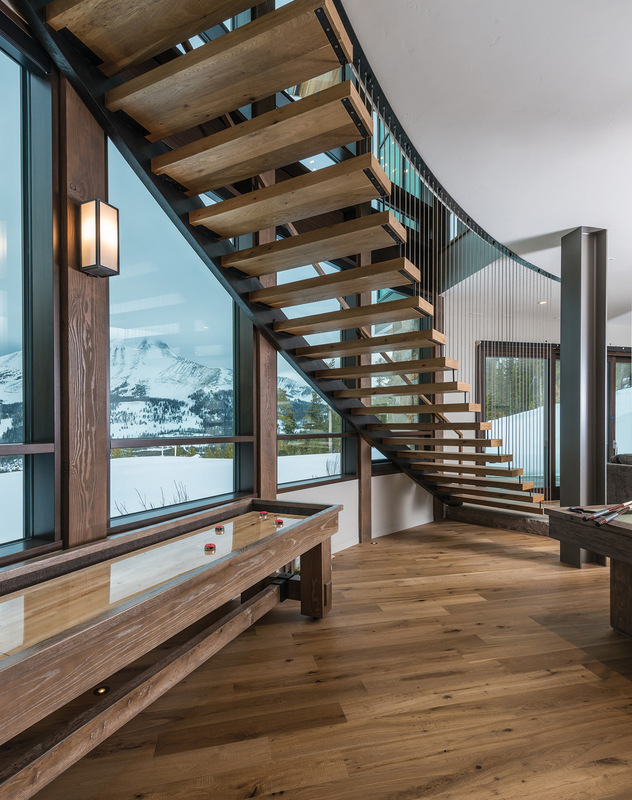 A floating staircase by Brandner Design leads down to the game room area. 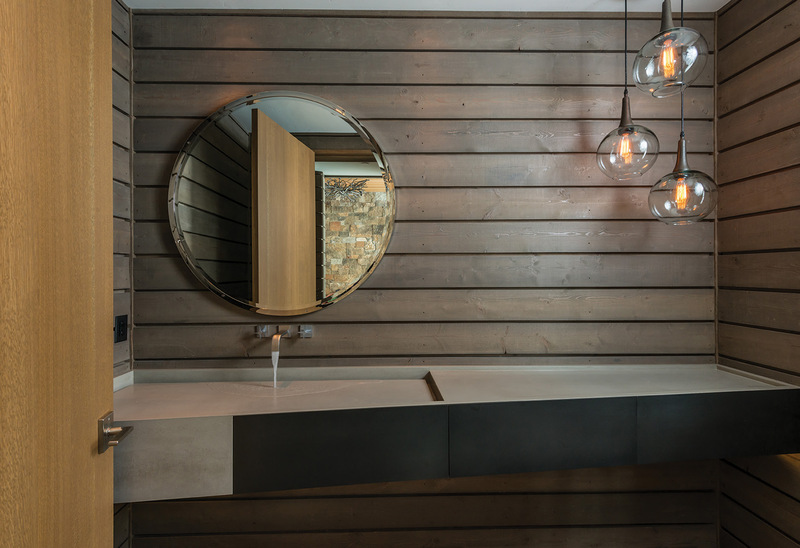 The dining room table, made from a 100-yearold walnut slab, was custom built by Elements Artisan Concrete, and the chandelier is a custom piece from Iron Glass Lighting. The dining room chairs are from Gallatin Valley Furniture. 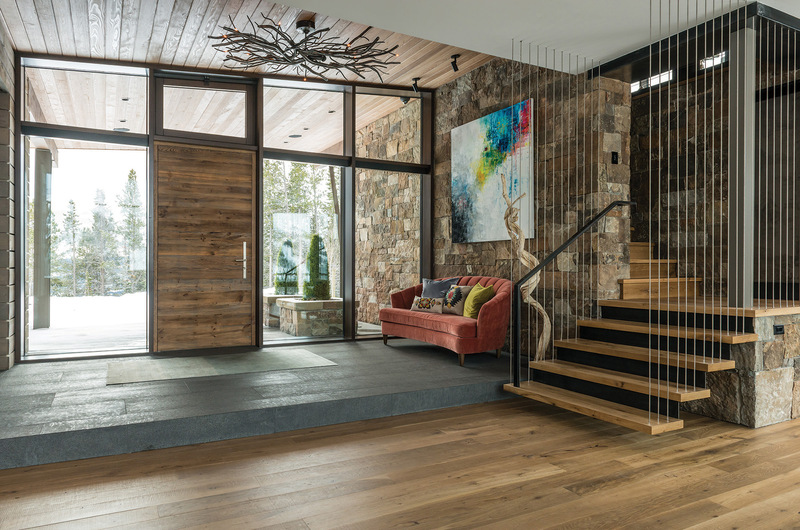 The front entry features a custom light fixture by Iron Glass Lighting and a painting by Pittsburgh, Pennsylvania-based artist Mia Tarducci. The custom staircase, leading to guest quarters, was built by Brandner Design. 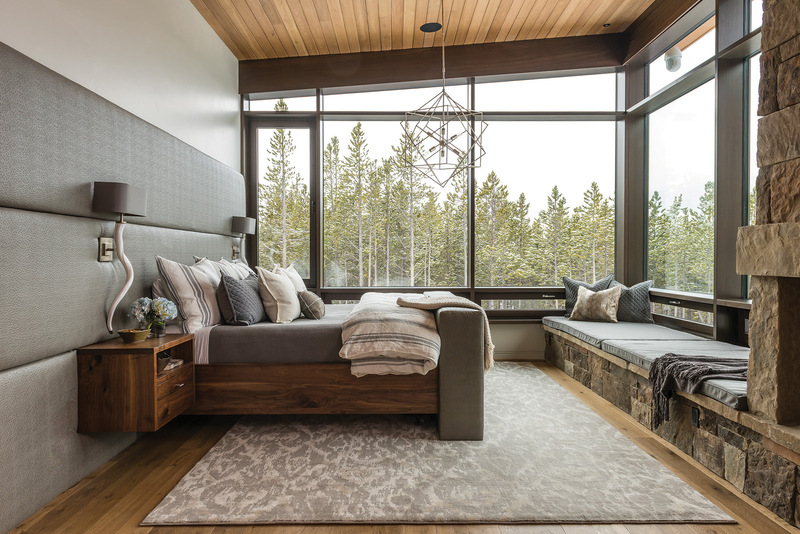 The master bedroom features an upholstered headboard and floating walnut nightstands by Fry Steel and Wood. SAV Digital Environments collaborated with Fry to develop a television lift cabinet, allowing the TV to raise from the bottom of the bed board with a digital control. 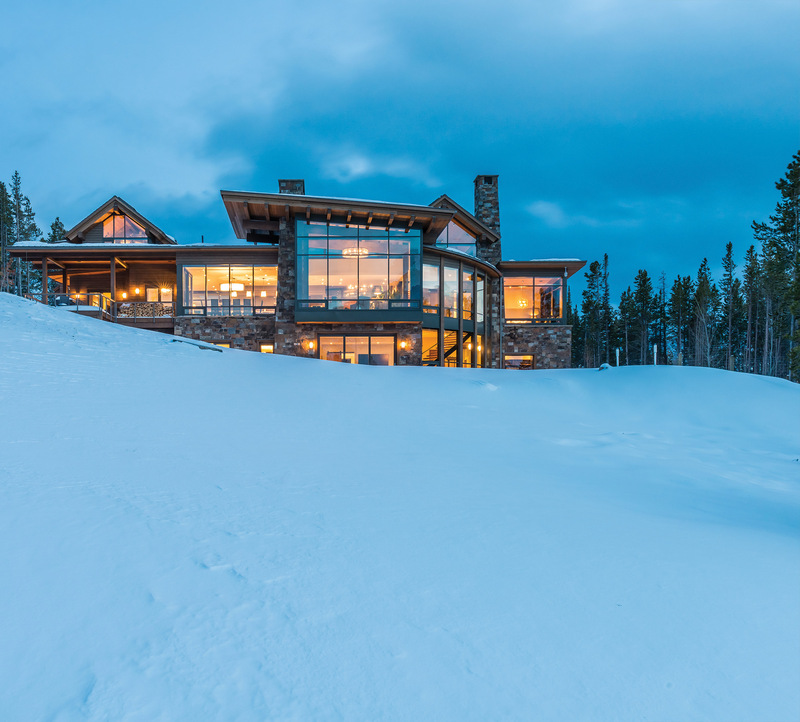 Architect Reid Smith designed this Yellowstone Club home, situated on a peninsula-like lot, to capture views from all sides. 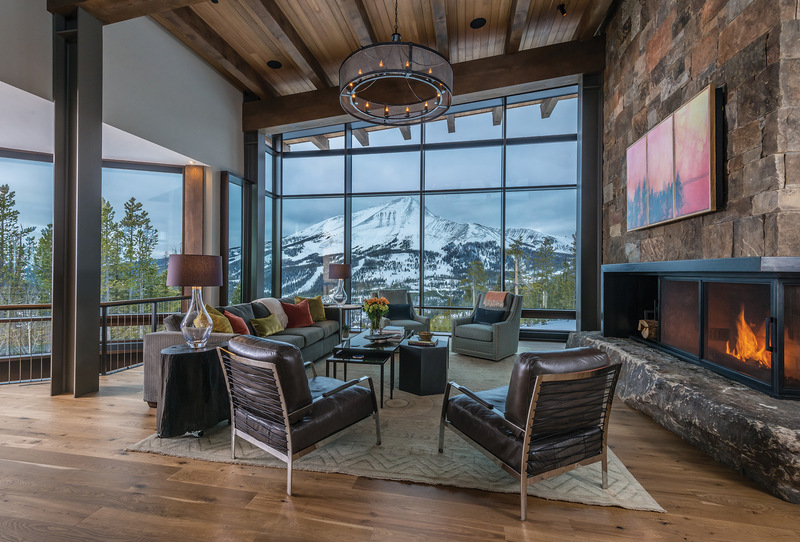 Lone Peak views are highlighted from the great room windows. A tree-stump end table from The Architect’s Wife sits next to leather chairs from Montana Expressions. The custom light fixture is by Iron Glass Lighting. A three-paneled painting by the homeowner’s father covers the flat-screen TV. SAV Digital Environments automated the panels to open with the touch of a button. 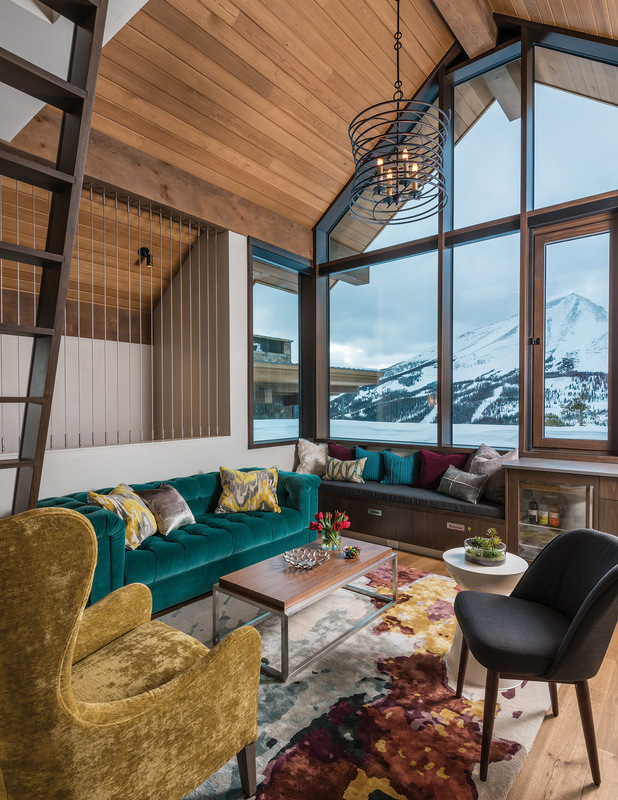 The guest quarters feature a living space with a custom railing by Brandner Design, a crushed velvet chair from Gallatin Valley Furniture, and a custom rug from Pennsylvania Rugs. A ladder leads up to a kids’ sleeping area. Elements Artisan Concrete created custom sinks for the bathrooms, some with sleek angles and others with unique curves.